Kaitlyn Schallhorn at Fox News offers a piece on the Nunes memo. 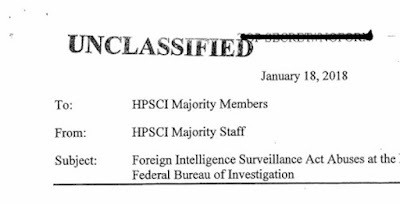 The controversial memo purportedly detailing federal surveillance abuses was declassified and released Friday following approval by President Trump. Democrats have dismissed the memo, arguing that it was selectively edited by Republicans to push a narrative that the Russia investigation is biased against the president. Here’s what we know about the memo and its connection to the Russia investigation. So what is this memo? The four-page memo, put together by the staff of House Intelligence Committee chairman Rep. Devin Nunes, R-Calif., reveals improper use of surveillance by the FBI and the Justice Department in the Russia investigation, GOP lawmakers said. The memo did “raise concerns with the legitimacy and legality of certain DOJ and FBI interactions with the Foreign Intelligence Surveillance Court (FISC) and represent a troubling breakdown of legal processes established to protect the American people from abuses related to the FISA process,” it said.